In the late 1800’s, the majestic Long Meadow Ranch property thrived with vineyards, apple orchards, olive groves, hay and a goat milk dairy until farming fell dormant during Prohibition. Over the following years, the property became swallowed by the encroaching forest until the Halls bought the property in 1989. The Hall family carefully breathed life back into the land, nurturing it back to its glory, and then some, by cutting back the abandoned olive trees and replanting the vineyards and apple orchards as you see them growing today. 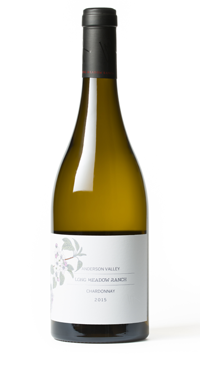 There are over 150 acres of Long Meadow Ranch vineyards planted in Napa and Anderson Valley that are farmed organically. The Hall family and Long Meadow Ranch artisans work together on the various properties that make up Long Meadow Ranch focusing on agriculture, wine, food and service. The Anderson Valley Estate is located in the west or “deep end” of the Anderson Valley in Mendocino County, approximately 2.5 hours north of San Francisco. With the Navarro River to the southeast and close proximity to the Pacific Ocean, a natural marine layer blankets the vineyards and creates terroir ideal for the estate-grown Burgundian varietals to mature slowly and ripen to the peak of their varietal character. A long growing season produced a vintage that shines in quality. Spring started fast and an early bloom was met with a dip in temperature, wind, and rains, which slowed the development and reduced yields. The result was a small crop of extremely well-concentrated fruit that ripened fully and slowly before an early harvest in August. The result is a beautiful expression of Chardonnay. Ripe pit fruit on the nose with a balance of grass and minerality on the palate.